Fiber optic cables generally have a smaller diameter, standard cable labels are not an ideal labeling solution. 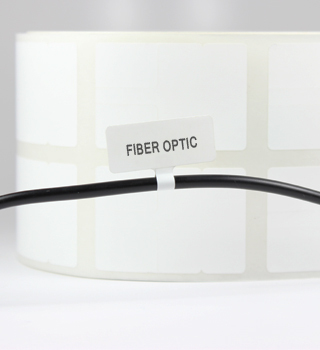 Fiber optic tags are specifically manufactured for use with fiber optic cables to provide enough space to add text and make it easy to view from either side. At ZipTape® Label ID Systems, we produce high quality fiber optic cable tags that feature an adhesive free section to surround the cable and plenty of room on the flag to properly label the cable. Thermal transfer fiber optic tags allow you to print a single tag that can easily be seen on a small fiber optic cable.